Launched in October 1962, the C-V8 series had fibreglass bodywork (only the door skins were aluminium), as did the preceding 541 series. All C-V8s used big-block engines sourced from Chrysler; first the 361 and then, from 1964, the 330 bhp (246 kW) 383 in³. Most of the cars had three-speed Chrysler Torqueflite automatic transmission, but some were produced with a four-speed manual gearbox. 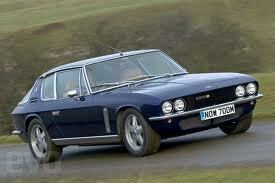 While the great majority of C-V8s were made in right-hand drive (RHD), ten were made in left-hand drive (LHD). The upgraded Mk II, introduced in October 1963, had Selectaride rear dampers and minor styling changes. Changes on the Mk III, the final version of the series which was introduced in June 1965, included a reduction in overall length, deeper windscreen, headlights all of the same size, improved interior ventilation, wood-veneer dashboard, the addition of overriders to the bumpers, and a dual-circuit braking system. The factory made two convertibles: a cabriolet, and a Sedanca that opened only above the front seats. The 1963 Sedanca was featured in an article by Paul Walton in the June 2008 issue of Ruoteclassiche, Italy's leading classic car magazine. Styled by the factory, the C-V8's front-end appearance proved controversial. The model was discontinued in 1966 after a total production run of 500. The fibreglass body, and the fact that the twin-tube frame was set in from the perimeter of the car, have contributed to the model's comparatively high survival rate. A CV-8 Mk II was featured in the 1965 to 1966 ITC television series The Baron. In this review, we take a look at the remarkable C-V8, the car which represented the pinnacle of the Jensen brothers’ thirty-year involvement in the motor industry. Arguably, it was the last of the true Jensens because it was the final model in a long line designed and built under the personal direction of Mr. Richard and Mr. Alan. Both washed their hands of the C-V8’s successor before leaving Jensen Motors in 1966. Before the word “supercar” had even been coined, the C-V8 was one. Powered by the 305 bhp Chrysler 361 ci V8 at first, and later by the 330 bhp 383, it was one of the most potent automobiles of its era — with handling, comfort, luxury and safety to match. The shape which clothed Jensens’s first V8 chassis in thirty years was designed by the Jensen brothers and their Chief Body Engineer, Eric Neale. Originally it was to have been called the 541 CT, or 541 Mk II, apparently to build on the lineage of the Jensen 541 models made since 1955. But somewhere along the line the term “C-V8” was invented, apparently for “Centre-Tube chassis, V8”. The fortunate few who came into contact with the C-V8 were literally amazed by its performance, although opinion was somewhat divided on its styling. Perhaps the kindest comment came from a reviewer who described the C-V8 as a gigantic, crouching four-eyed cat, and a “pretty cool cat at that”, to use his language. It was, of course, the slanted headlight treatment which most attracted or offended the eye. The recessed light pods were supposed to have been finished off with perspex covers but these were deleted late in the design process when it was too late to change the shape of the wings. Introduced at Earls Court in October 1962, the 361 ci C-V8 with its TorqueFlite column auto was a smash hit. Yet, even as the first production examples were reaching buyers in early 1963, the factory was working on an improved version. In October that year, the Mk II made its debut, featuring some minor body modifications and the promise of more to come. During the Mk II model run, which ended in July 1965, a LHD version was introduced, as was a manual gearbox option for the RHD cars. Significantly too, the engine was uprated to the excellent 383 ci unit, used in all subsequent Jensen models until 1972. In mid 1965 came the last version of the C-V8 — the Mk III — featuring a redesigned front end with lower scuttle and deeper windscreen, a slightly shorter body, much improved ventilation, a beautiful veneered dashboard and split braking circuits. Among the minor changes, new bumpers with overriders were fitted, the headlight arrangement was altered and the headlight pods lost their chrome surrounds. Jensens used the services of a team of racing drivers, including Roy Salvadori, to take the Commanders Cup at Snetterton race course (a trophy for 24-hour endurance events) with an experimental C-V8 manual just prior to the launch of the Mk III. The Mk IIIs were certainly the most developed and luxurious of the C-V8 line. They remained in production until mid-1966, the last of them going out in December of that year, soon after the introduction of the steel-bodied Interceptor. Including the prototypes, 500 C-V8s appear to have been built. The Mk IIs are the commonest — the Mk Is the rarest. Several series designators distinguish the different types of C-V8s. The 104 series is the only confusing one because a 104-series car can be either a Mk I or II, and the Mk IIs can have either a 361 or a 383 ci engine. 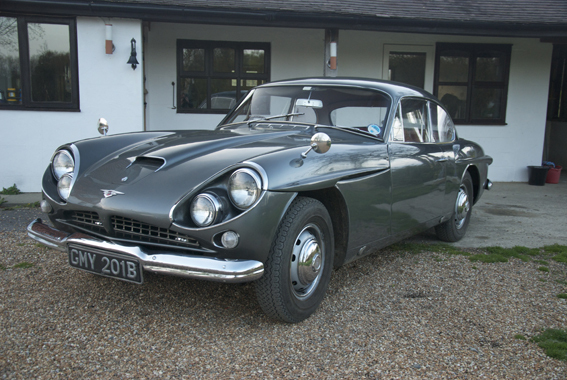 In all, Jensens seem to have built seven experimental C-V8s of which the first three were either scrapped or renumbered as ordinary series production cars. The other four were allowed to leave the factory wearing their experimental chassis number tags.Engine-wise, the cars were stock standard. Jensens undertook no modifications to the motors other than to spray them black over the original Chrysler Turquoise or Orange. In all, 128 cars received the 361 ci engine (all but one being S series, the other being an R series), and 372 had the 383 ci motor (either V or A series units). 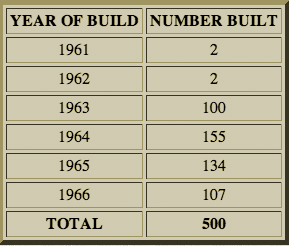 Production peaked in 1964 when Jensens were finishing an average of three a week. Of course, no manufacturer could survive on such a limited production and for Jensens the continuing profitability lay in the outside contracting work. 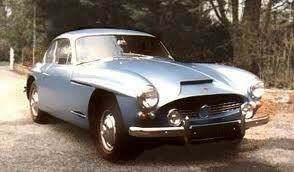 During the years of the C-V8, this involved the Volvo P1800, the Austin Healey 3000 and the Sunbeam Tiger. The annual production of C-V8s was minuscule by comparison with the outputs on those. C-V8s were very British cars and the few which went abroad were generally delivered to special order. Several LHDs were built for the United States but the arrangements with dealers there were not satisfactory, and the export pitch can be said to have been only a half-hearted one. The C-V8 sent to Turin in 1966 for rebodying as the first of the steel Interceptors was originally a LHD Mk II taken back from a New York dealer who had been unable to sell it. The manual gearbox was an interesting, if unpopular, option on C-V8s. All of the manuals were built in RHD and most of them were Mk IIs with the 361 ci engine. The manual setup, when tested by reviewers, was considered a bit too heavy in the box and clutch for pleasurable motoring whereas the column shift TorqueFlite was a revelation to most testers, many of whom raved about it. The manual gearbox used by Jensens, the A-833, had been introduced by Chrysler in 1964 and was designed to withstand the worst stresses which a race-tuned 426 Hemi could throw at it. Behind the standard 361 it looked a bit overengineered and few buyers wanted to pay an extra £100 for the dubious pleasure of doing battle with the heavy clutch and shifter. The main drawback of the A-833 was that, as engine revs increased, so did the effort needed to operate the clutch. This made the car tolerable at normal speeds but a real handful if driven in anger. The kindest of the reviewers who tried it on the Goodwood race circuit in 1965 described it as “a real he-man’s car”. As with the manuals, most of the LHD C-V8s were built in the Mk II range, all but one of them with the 383 engine. They achieved little success overseas because they were little known. It would not be until the release of the Federalized Interceptor II in 1970 that Jensen cars began to be exported in quantity. C-V8s were painted mostly in sombre colours, although as usual the customer could have anything within reason, for a few pounds more. Two of the cars were done in a striking scheme first seen on the 541R with the body painted Pastel Pink, the roof Dusk Rose and the interior trimmed in Mushroom. In keeping with Jensen tradition, C-V8s were supposed to impress with their dignity, the promise of that exhilarating power lurking discreetly underneath. Loud colour schemes just wouldn’t have been right and so less ostentatious blues, greens, greys, whites and reds were the norm. In keeping with the conservative look, the choice of trimming boiled down to just a few main options, although again anything was possible if the customer so desired. 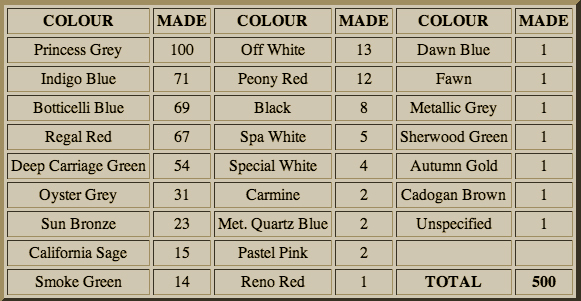 Beige was the commonest trim material followed by a very luxurious Bright Red, then Blue-Grey, Black, Mushroom, Dark Red and Green. Hardy Amies was contracted to trim two cars in pigskin to a design of his own choosing and, although he was successful in this, his design was not adopted for production. Nevertheless, he kept one for himself for many years. Several C-V8s were built specifically for the Jensen brothers as personal transport. Richard Jensen seemed particularly fond of the type, having in turn a Princess Grey Mk I, a Princess Grey Mk II, an Oyster Grey Mk III and finally an Indigo Blue Mk III which was presented to him on his retirement from the company late in 1966. The organizers had apparently forgotten Richard’s preference for grey-painted cars but there is no truth to the story that HEA 5D had to be resprayed before he would accept it. It was resprayed, but much later on — and only after its troublesome Indigo Blue paint had failed! For Alan Jensen, the factory built only the one C-V8, a Mk II painted Smoke Green. Most who bought C-V8s were company types, generally chairmen and the like. A few minor celebrities bought them but for the price of the driving ticket you needed to be pretty wealthy. The cars cost around £3800 on release in 1962, though the rates of tax came down the following year and those who waited got one for “only” £3300. By the end of the model run in 1966, costs had pushed the price up again to around £3700. By comparison, you could have had a 3.4 litre Jaguar Mk II with overdrive for only £1500. In the United States, you were looking at paying around twice the price of the best Corvette money could buy, which perhaps explains why only five C-V8s are known to have gone there new (and one of those did not sell). Publicity for the C-V8 was handled in a low-key way by Tony Good’s London-based firm, Good Relations. The most notable publicity afforded the C-V8, however, came with the loan of a Mk II to the producers of The Baron, a British television drama series starring American actor Steve Forrest as antique dealer John Mannering, known by the nickname of “the Baron”. By the standards of 1965, the series was a fine example of the spy genre and was well received. Most of the 26 episodes displayed the C-V8 to great effect and are well worth a nostalgic look. And if the early series ofMinder comes back, watch for an episode entitled “The Car Lot Baggers” — it features a C-V8 driven by a gypsy! Like most Jensens, the C-V8 has no competition pedigree but it acquitted itself well enough when called upon to do so. At the annual Brighton Speed Trials in 1965, C-V8s took first and second place in their class, beating off 10 Jaguars in the process, which was certainly one in the eye for Sir William Lyons (the crouching cat beats the leaping cat!). The two C-V8s involved, an automatic 383 and a manual 361 driven by long-time Jensen enthusiast Lord Strathcarron, ran the bumpy standing kilometre in 28 seconds. The only Convertible C-V8 turned out to be a disaster for the factory and for Lord Carrington, who bought it. He had trouble with hood leaks and lots of other things and his complaints strained relations between the factory and their London dealers, Folletts, who sold him the car. Carrington traded it in on an Interceptor as soon as they became available in 1966. Another unusual C-V8 was the unique Sedanca de Ville, a specially bodied Mk I with a folding roof section above the front seats. Both of these special cars survive in roadworthy condition. Shortly before the Jensen brothers departed the scene, the C-V8 was chosen to showcase the Ferguson four-wheel drive system, a project dear to Richard Jensen’s heart. The prototype was mobile by 1965 but only one was built before a decision was taken to dispense with fibreglass and body the production cars in Italian steel. The C-V8 FF prototype was certified as broken up in 1966. Of the 500 C-V8s built, many are still in existence, their fibreglass bodies and solid chassis seemingly having defied that great leveller of all things automotive, the British weather. The value of used C-V8s plummeted in the late 1960s and 70s, particularly as large numbers of the infinitely more appealing Interceptors (to drivers of the time, that is) were on the market. For a time, C-V8s were hardly thought of as worth saving, although the factory ran a couple of them as service department loan cars. Today, C-V8s are rare cars much prized by their owners. Some have had expensive restorations lavished on them while others continue to serve faithfully as everyday transport, just as their designers intended. Mechanically, they are well supported by Mopar with both Performance Parts and regular parts for engines and drivetrains. Many body components are available through specialist suppliers in England.